PSA: If the Writ Crafter is telling you to download LibLazyCrafting, then you need to download LibLazyCrafting, with your choice of Minion or manually. LinkIf you download the libary manually, note that it should be placed within the AddOns folder. Please note that LibStub and LibAddonMenu-2.0 are also required. Notes on Master Writs: If your main purpose is to do Master Writs, I highly suggest Writ Worthy. The window for them does not show up. It is all autocraft at the moment. Where to send it: To me on here on esoui, or on reddit to /u/canopus12. Feel free to send me a mail in-game, both on NA and EU to @Dolgubon. 1. If it is a Lua error bug: Take a screenshot, or copy the text. Please include what you were doing. 2. If you see a message on the crafting window that states an error was encountered, please send me the exact text of the quest conditions, as shown in the journal or quest tracker. 3: If it is something else: Do both of the above, and include any other relevant information that you can. Anything that you send might be what I need to fix the bug. - Some settings options untranslated in FR, DE, and JP. Feel free to send translations.- Known bugs: If you're in the crafting screen but get pulled away by a queue popping, the UI will not disappear. No plans to fix this minor edge case. When reloadingui with writ containers, they will now be sorted at the top if you have keep new status turned on. Fixed another lua error when using non auto crafting. Added a prompt to tell the user to download LibLazyCrafting if they only have the (old) Writ Worthy version. Fixed the addon ignoring the new shipment containers. *This* should fix it. Uncommented the LibFeedback line in the manifest. Another hopeful fix? Kinda throwing whatever might stick. Emergency update, hopefully it fixes the lua errors. Please note that you must download LibLazyCrafting as a standalone addon! Will put change notes later when I have time. Including but nowhere near limited to: API Version bump. Trying something else to fix the addon attempting to use writ rewards. A possible fix for the addon attempting to use writ rewards. Fixed a minor typo that caused an error when the Set Crafter was not installed. Now removing d' from French quest conditions, since it is largely irrelevant. Probably fixed an issue which threw a lua error in LootHandler.lua when nil was passed to GetItemLink. Update API version. Updating between now and the Wolfhunter patch will disable the prompt to update your addons. Some more changes to accommodate unofficial localization patches. Changed the ReticleHandler.lua file to load the functions after the Initialization event. Added a check for Library existence, and added a debug message which will show if they are not found. Various changes to accommodate unofficial localization patches. Fixed a bug where the window would throw a UI error when it was closing. Ported over the old feedback Window code to the new LibFeedback. Fixed the Paypal link in the feedback window. Moved the bank withdrawal over to the new function DoesItemLinkFulfillJournalQuestCondition. As a result, instances where the add-on withdrew the wrong item should no longer take place, and will now more reliably withdraw items. This includes: Withdrawing a Ta when the glyph condition is not fulfilled, and withdrawing Aetherian tea properly in German. The add-on will now properly prioritize potions with fewer traits. German should now craft necklaces properly. Some other stuff i don't remember. Sorry, guess there's some more undocumented features! /countsurveys and /countunearnevouchers will now also count items in your inventory. Dealt with a change in the german translation of the game. Will now withdraw Aetherian Tea in German. Should now show a defaults button in the settings menu. Resets most but not quite all settings. Fixed minor localization bugs in German and French. German fix for jewelry writs. French version should really be fixed now. Jewelry Writs support added for German and French. Majority of strings translated for German and French. If you see any non translated strings, let me know. Added Reticle colouring. On by default, it will colour the reticle RED if you target a crafting station when you have a writ at that station, and GREEN if the crafting station has a writ but the writ is complete. Fixed a bug in non English Languages when looting writ reward containers. Fixed a bug where the addon would fail to load when it was the only or one of a few addons active. Fixed a bug where non white items would not be crafted. Added support for Normal Jewelry Writs. There are currently no settings in the settings menu for it. Fixed the divider in LAM when the addon was loaded by itself. Fixed the constantly repeating message that the settings were reset. Wiped saved variables, but they are now account wide. However, you can choose to have character specific settings on any toon you want. Preliminary backend work for supporting jewelry. Set the addon to use Nickel by default. It will be set to ON for some people even if it was previously OFF, so you may want to check. Fixed a bug where the addon would fail to load when the user had no other addons using LibStub. Basic racial styles will no longer reset themselves in the settings menu. Removed some layers of unnecessary folders and the LibAddonMenu.txt file. Fixed a lua error which showed up on quest turnin. The addon will now properly complete Master Writs without leaving the interaction with Rolis Hlaalu. Removed a d() left in accidentally. Added some more bank debug messages. Changed a helper function to be shorter. The bank withdrawal now withdraws from the storage containers. Additionally, if you even just enter a house, and have mats in the storage containers it will withdraw them! The 'Crafting could not be completed' message will now no longer show up at the enchanting station!!! If you turn off a style, it will now set the saved vars for that style to nil. Just a really slight performance upgrade. Like, really, really, really slight. Might have made a difference with master writ turn ins? Haven't tested them quite yet admittedly. Updated the loot opening slightly. It will now not open while swimming or in combat. About a second after it opens the last container, it will also check to see if there's anything else it needs to open, in case it missed something. Note: So that version numbers are not so unwieldy, they have been changed to an a.b.c format. Previously uploaded files have not been changed, but they have received a new version number on the change log, which is in brackets. The addon will now only exit the quest acceptance window if a quest was actually accepted. This will allow users to accept writs for crafts which they have turned off. Fixed a bug where tier 8 and 9 smithing writs were being crafted a tier lower. Fixed a bug where the automatic quest dialogue would not exit the crafting writ acceptance dialogue if not all writs were being accepted. Fixed an issue where any master writs with an umlaut would not be crafted. Mainly affected German. Fixed an issue where ice staves would not be crafted in English. Fixed an issue where the addon would not craft non set items at a set station. Removed LibMOTD, as it is not currently needed. Added the English settings strings to the default file, which will help prevent errors due to missing strings in translations. Fixed a bug where German clothing master writs were not being properly recognized when requiring light armour. Added a German translation for an option in the settings. Added comments into the MasterWrit.lua file. Fixed a bug which only occurred on the PTS, where the addon would craft the highest valid level of item, rather than the lowest. Added more style stone error messages. Now, if the user does not have many styles known, the addon will direct the user to learn more styles, or if not many styles are allowed in the settings menu, it will direct them to it. This should cut down on the 'bug' reports I get based on style stones. Added more support for Japanese Enchanting Master Writs. Fixed the issue with German Prachtleder writs. The addon will now withdraw potions in German when the quest uses Tränke instead of Trank. Changed the English settings text to be clearer. In particular, it now notes that Alchemy and Provisioning only withdraw items from the bank. Fixed an infinite crafting issue. Fixed a lua error when crafting master writs. When a quest was updated, the addon removed all craft requests associated, then attempted to re-add everything if necessary. This helped deal with deconning stuff, but created an issue with because the quest update event ran before the craft complete event, messing with the queue. non CP items will now be crafted again. LLC update. See the LLC page for more info. Fixed a bug where heading to an enchanting station first would prevent crafting any smithing items. Possibly fixed the bug with double crafting. LLC updates, including a possible fix to the rare double crafting bug. Foundation for FCOIS and ItemSaver support. Minor update to accommodate the RU version. Added structure for future itemsaver support. Made changes to the writ turnin when loot when received is turned on to make it a bit nicer. Fixed a lua error on load when a master writ was active. Added more detailed comments to the en.lua file giving instructions and notes on translations. If you maintain an unofficial translation, or plan to create one, please take a look at it. New items have been added to the translation files, allowing for more customized behaviour in some situations. Fixed multiple bugs in Japanese. Added limited functionality for automatic quest acceptance for Japanese. Potentially fixed a bug where not all items would be crafted. Fixed a lua error inadvertently introduced in the last update. Removed a d() which showed up when crafting enchanting writs. Fixed a bug in German where Enchanting glyphs would not be crafted. Updated the addon to handle the new Clockwork City sets, if they show up. After learning why I gave up on fixing it before, Quest turn-in might be fixed. Maybe. Fixed a bug where potions food and drink would not be withdrawn from the bank. Occasionally crafted food, drinks and potions would lose the marker indicating they were crafted, and as a result the addon would not withdraw them. The crafted checks have been changed to use other indicators of an item being crafted. Fixed a bug where the settings menu would state that the wrong auto loot setting was chosen. Fixed a bug where /countunearnedvouchers would not display the number of vouchers. Fixed a bug where opening writ containers from the inventory with auto loot turned ON would get the game stuck on an empty loot window. The addon will now prioritize potions which have fewer traits over those with more traits. Fixed a bug where master writs would not be properly added to the queue on /reloadui. Fixed multiple issues with German Master Writs not crafting. The slash command /countsurveys will now also tell you how many of each type of survey you own, and it has been translated. Added a bank withdrawal debug mode, which can be accessed with /dlwcdebug bank, and also added /dlwcdebug delay, which adds a delay after crafting master writ items. The BankWithdraw.lua file has been updated to include debug messages. Added comment headers to each file. Fixed the cursor issues when looting writ reward boxes. Moved localized item material names (e.g. Iron Ingot) to depend on game functions instead. This fixes the untranslated part for French, means less needs to be translated for new languages, and also means those names have been removed from the language files. Added LibMOtd, to help communicate with users. 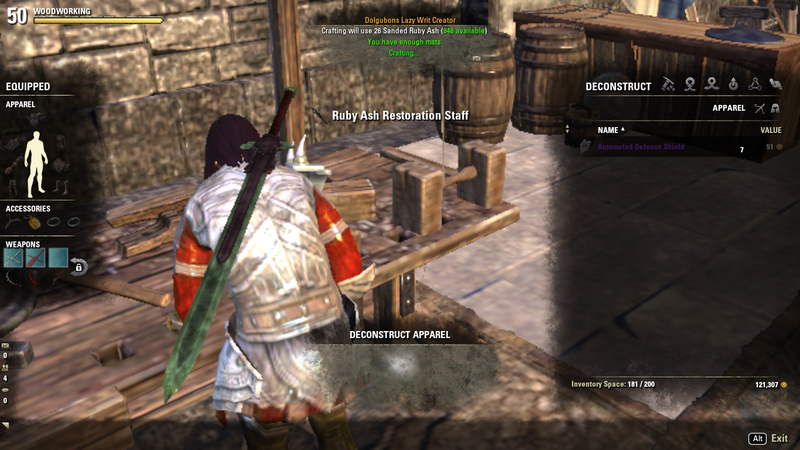 Fixed a bug in the writ reward logging where Provisioning, Alchemy and Woodworking seemed to have way too many completed. As a result, the statistics have been reset, and a message has been placed using LibMOTD to alert users to that. A rare bug with Enchanting items not always being crafted when used with right click to craft was fixed. Display error with master writs fixed. Minor LibLazyCrafting changes. See the library page for more info. Fixed an issue where alchemy crafting mats would not be withdrawn. Note that if you have been having issues with many other items, this will probably not fix it. Added a string that was missing in the Settings Menu. The addon will now remove items that fit quest requirements for all crafting writs. This includes Glyphs, Weapons and Armour, in case you inadvertently deposit some. Fixed a typo where voidstone ingots were referred to as voidsteel ingots. Dealt with one (so far) typo in the German item writs requiring withdrawal. Fixed a rare LUA error that would appear when using this addon with Writ Worthy. * Second upload: Removed an extra file accidentally left in. Will not affect functionality, so no need to redownload. The item withdrawal from bank has been refactored. Note that this may result in bugs, but it should work fine. However, it should support German and French. If you encounter any issues where an item is not withdrawn, please take a screenshot of the quest in your journal, and also copy and paste the item link. I will need this info to fix it. German Master Writs will now craft properly. Removed an old /slash command that no longer has any effect. This version moves the update prompt one week later, as well as adds a warning that Master Writs may not be properly crafted, due to API changes. This warning will only show up once Horns of the Reach is released. Removed an accidentally left in debug message. Changed the missing style stones message to help prevent false bug reports. Added an output line when a Master Writ was prevented from being accepted, making it clear that this is an optional feature of the addon. Expanded the Quick Quest Dialogue to work for Master Writs. When crafting a master writ, the addon will tell you what crafting type it is for. Fixed an error where settings for the 9 style stones wouldn't stick. Sorry! Healing staves won't be made as Ice staves anymore for Master Writs using Right Click to craft. Added Right Clicking a Master writ to craft it. Off by default. Turning it on will disable the current Master Writ functionality. The addon will now take items for provisioning and alchemy from the subscriber bank. The addon will no longer recognize Crafting Certification quests. Unfortunately, this is not something I can realistically support, and additionally, it is a quest that is done only once, with an option to skip the whole quest anyway. Updating the crafting library with minor fixes. Fixed a bug introduced with the last version where if you had a Master Writ, and walked up to a normal crafting station for that craft, you would see a UI error. Addded Morrowind Sets and styles, in case Master Writs request them. Updated how the queue for Master Writs works. This is internal, and other than possibly fixing some random bugs, should not affect anything else. Actually did the API bump. Added a slash command, /countsurveys. This slash command will output in chat the number of surveys you have. If a master writ does not run immediately, you can type /rerunmasterwrits. This should fix the problem. Fix for lowercase items in the inventory. Hopefully stopped the bug where not all master writs would not be crafted immediately. Removed some code accidentally left in. Fixed a bug that would crash the game if the user did not have enough traits known to craft a master writ item. Fixed a bug where if the requested item was removed from inventory, and then later added to it again, (e.g. deposit and then withdraw it) it would be crafted again. It is possible that this will fix all the instances of double crafting, however if you still encounter any please let me know. Added in some German translations. Removed some accidental d() messages. Removed Shipments from autolooting. Will likely be readded later. Bug for German woodworking and clothing writs fixed. German Master Writs should work now. Added in a Master Writ Saver option. It will not prevent the quest window from opening, but it will prevent you from accepting any master writs. Removed some code left in by accident. Mouse will now not appear if loot when received is turned on. Fixed some logic regarding writ container and shipment autolooting. Settings in non-english languages will now not have a blank setting. The setting will be in English for JP+FR though. Added DE translations for the new settings. Fixed a lua error that occurs when the thieves guild reward boxes are opened. However, they might still be autolooted. Added an option to loot writ containers when received. Added an option to keep the new marker for writ containers. Will now auto loot shipment containers. Added a hook for an unreleased addon from Silvereyes. Added a hook for Prepousterous users. Loot, quest acceptance, and tutorial functions now have their own files. German enchanting master writs will now work. Changed the Master Writs Default to ON. Fixed a bug where Master Writs requesting Battleaxes were crafting Axes. This is due to a typo in master writs where a 'Greataxe' is requested instead of a Battleaxe. Left a fake Master Writ quest on by mistake. Soul-Shriven will now craft, as well as other master writs containing "-". Daggerfall Covenant styles will no longer cause Daggers to be created in some cases. Upgraded how the addon finds out what to craft. This should further cut down on unintended errors. Fixed a bug where some styles were not being recognized. Fixed a bug where shielding and bashing glyphs were mixed up. Fixed a bug where Master Writs requiring a set with '-' in the name were not being recognized, and was causing a lua error. This seems to be due to a bug in Lua itself where string.find doesn't recognize '-'. Added in output messages for enchanting and smithing telling the user if the addon could not successfully find one of the requirements for the master writ. For example, if the addon cannot find a matching set, it will output in chat "Set not found." This will additionally help the user know if something incorrect might be crafted, as well as aid debugging purposes. Fixed the default quality for enchanting. If a quality is not found, the addon will craft a white glyph. Fixed a bug where the addon would always say it was crafting something with Rubedite. It will now accurately say if the item will be made of Ruby Ash, Rubedo Leather, Ancestor Silk or Rubedite. Removed an accidental debug message left in. It would only be seen if your game loaded pChat prior to this addon. French and German will now work. The Master Writ toggle in the settings now no longer requires a reloadui to take effect. Master writs with Greatswords, Greataxes, and Ancient Orc and Reinforced will now craft properly. Should have a new option in the settings to turn master Writs off. You'll need to reloadui for it to take effect if you have any master writs at the moment. Will no longer craft orc when it should be ancient orc. Reinforced trait will no longer cause equipment to be made in the Orc style. Fixed the bug for non english languages; won't work for other languages right now. Smithing Master Writs now work! Should work for all languages, but it has not been tested on them. Enchanting Master Writs will now recraft the glyph if it is destroyed. They will also still craft if you reloadui or relog. Enchanting Master Writs are now available! This is preliminary, and pretty basic. It currently ignores auto craft settings, and does not show the crafting window. However, please test it and let me know if it makes the correct items! Abandoning the quest will do nothing. The addon will still craft the item, even if the quest is abandoned. Errors upon opening writ containers should no longer be received. Fixed a minor bug in German regarding grand glyphs of magic. Fixed a bug with enchanting that failed to tell the user that they were missing runes. Added options to turn off alchemy and provisioning. The addon still does not craft for those crafts. Attempted to fix the provisioning and alchemy problem that had been encountered by some people. Added statistics back in. The addon will automatically save what you get from writs, as well as how many you have completed. At the moment, the only way to view it is with /outputwritstats or by checking the saved variables. Increased the requirements for auto completing writs, which should prevent quests that are not writs from being completed. Now doesn't grab writs that are not selected in the settings menu. Only writs should be auto completed now. Also zipped properly, just in case minion doesn't recognize it. Fixed the Automatic leaving of craft windows. Added an option to turn off automatic acceptance and completion of writs. Option to leave writ station when writs are complete. Removed an accidental debug message. Enchanting was showing ItemIds in the output, this has been fixed. The toggles for writs in the settings menu were not being applied properly. This has been fixed. If a type of writ is turned off in settings, the addon will not auto grab the writ. Various behind the scenes changes to begin accommodating Master Writs. API bump, so you don't see messages on the PTS. Fixed the missing craft button on enchanting, and the infinite glyph bug should still be fixed too. The underlying bug behind the infinite glyph bug has been fixed, thanks to @depeshmood. Attempt to patch the infinite glyph bug. Fixed the JP version (I hope). Fixed the bug where the window was not updating properly. Fixed a bug that happened when your inventory was full, and you used the writ grabbing. Various code changes to make it a bit cleaner. Fixes to French Enchanting writs. Glyphs requiring a rune with an accent should now be crafted. Fixed a minor german bug. Fixed the writ grabbing bug some people have been having. Added a feedback window for EU. Changed how the crafting is done, as well as alchemy grabbing. - There is now a queue of items. When the addon identifies an item it needs to craft, the item is added to this queue. Changed various strings to constants. This includes in the saved variables. Your settings will be unchanged. Added a (15s) delay to the alchemy grabbing. If, after the delay, an item is still missing, it will attempt to withdraw it again. Some cleanup of the alchemy grabbing. Statistics for writs (What you got from them) will now save for everyone. Automatic sending of data has been disabled, however it is now possible to manually send the data (i.e. I'll ask a few high volume writ crafters to send me data) Note: Will not save everything from writs, only the things worth more. I'll change that later. If you update between now and One Tamriel, you won't get a reminder to update your addons... if you don't, you'll get a reminder. But really, you should also update at that point too. And a week after that. And every week, really. Maybe more often actually. Same as version 33.10, but this time it's actually been uploaded. Some settings were not being properly saved to the saved variables. Widened the net for Sending Data. Blacksmithing writs were broken accidentally last patch for German. This has been fixed. All Woodworking writs should be working now for German. One of the code changes introduced a bug with the tutorial that has been fixed. German writ bugfixes. The addon will now craft despite ZOS' horrible translations. Moved to the new ZO_SavedVars:NewCharacterIdSettings to keep settings after name changes. Fixed a syntax error in the Japanese version. Added in some more French Translations. Moved the Options tables from the .lang files to its own file. Reformatted the translated strings in the .lang files. Created a dynamic list of styles, instead of having a table in each .lang file. Moved around various bits of code in the .lang files. If the user's crafting level for equipment is not high enough, the addon will no longer attempt to craft anything, and will display a message telling the user that their crafting level is not high enough. (The message is only in English so far though) Enchanting will come later. Won't say out of date on Monday when Shadows of the Hist comes out. Added a setting in to allow the user to either follow the Gameplay Autoloot, or ignore it and use a custom setting just for Writ Containers. Auto-looting of writ containers will now work for Japanese boxes. Auto-looting of writ containers will no longer clear the 'unseen' status of writ boxes. It now effectively works in the exact same way that it did prior to Dark Brotherhood. If Auto-Loot is on, the addon will now automatically loot any writ reward containers that are opened, and then return to the inventory screen. Doesn't work for Japanese yet, still waiting on my translator. Added in a data sending option. Data will only be collected if the user is a member of Angry Unicorn Traders or Bleakrock Barter Co on NA, and is using the english client. This function can be toggled in the settings menu. The information will be used to compile data on the chances of getting items from writs, with the goal of finding out how profitable writs are to complete. Added in the ability to change the style stones this addon will use. The default is still the 9 basic alliance styles, however you can exclude any of them, or add any other styles in. 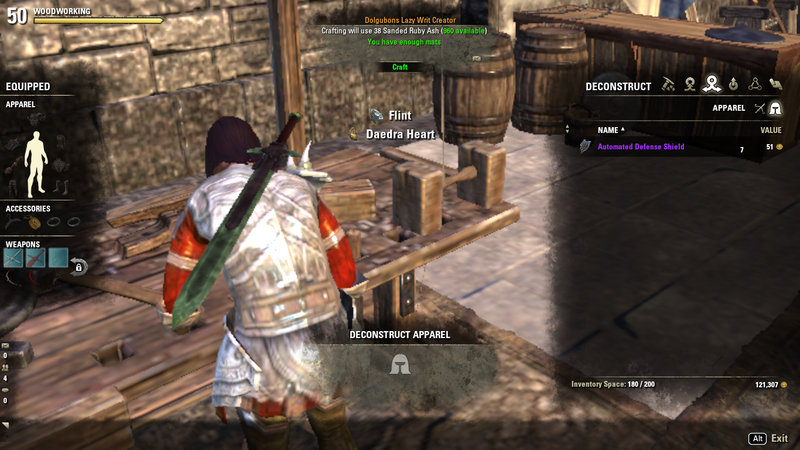 Broke writs requiring epaulets in the last update. They should be fixed now. When using the writ for enchanting, the message 'Craft was not completed' will no longer show. Fixed a minor bug with writs requiring Cotton Epaulets. Removed 2 extra files accidentally included. Added in support for Japanes. Warning: May craft incorrect items, or craft nothing at all. If this is the case, please contact me with the exact name of the item it should craft, as well as the exact spelling of the quest condition. Broke writ grabbing for enchanting in the last update.... should be fixed now. Broke the writ grabbing feature in the last update, it's fixed now. I hope. Removed the fix for the conflict with Votan's Mini Map, as it should no longer be needed. Minor fix due to a conflict with Votan's Mini Map. Ravage potion grabbing was broken in the last update, and has been fixed. The window now has an updated look! A minor bug involving food names has been fixed. Items will only be withdrawn if the name matches exactly. Since potions and food are not recognized as crafted, the addon did not withdraw them. This was introduced in v30.9, and has been fixed. Fixed a bug where the addon would take out non crafted items, instead of the crafted versions. Added colours into the French version. UI stuff is still untranslated though. Fixed a bug where if you did not have access to the crafting bag, but still had stuff in it, the addon would fail to recognize those mats. Forgot to remove a debug message from the French version. Sorry! Fixed the bug preventing the addon from recognizing French Gauntlets. Actually fixed the German language bug with bows. A minor German language fix. Fixed some french writ bugs - if you find any more, in any language, let me know. Changed how not finding a mat or type of equipment are handled. It will now no longer craft anything. Removed the bug where 'Craft was not completed' would be displayed in the enchanting craft window. I forgot to add that it supported the API version 100015, so it said it was out of date, even though it wasn't. Now works on the PTS and with crafting bags! Some more german language touchups. Kalzinium was spelled as Kalzinum in the German version. This has been fixed. The German error 'fixed' in version 29 has now been fixed. Fixed a lua error found on line 428 of the .de file. Error only appeared when user had no Ta, essense, or potency stones needed. Increased the size of the craft button in German so 'craft anyway' fits. Added colours into the text. ZOS changed the names of staffs in the quest conditions for German. The addon has been updated to reflect this. Some German translations were changed. The window will now save its position. Changed how strings work to make localization possible. The French version should now actually be functional. Please make sure it is crafting the correct thing. If it is not, please let me know. Not a complete localization. I suggest turning off autocraft. Fixed the Ruby Ash bug. Fixed some Enchanting errors that would throw up UI errors under certain situations, but did no affect the functionality. Actually fixed the Ancestor Robe bug. Fixed the spelling error in German for BlitzStab. It should now craft them correctly. Fixed the error where the German version was not finding runestones anywhere. The French version should now be functional. Similar to the German version, I expect some bugs. Please let me know if you find any, and I suggest turning off Autocraft. Also, this is not a complete localization, only a functional one. Added in a quest checker that will allow me to check some quests, even when I don't have them. It is not a simple process however, so I'll likely only use it for bugtesting. The last update had a few changes to how some outlier cases were handled, which introduced a bug where Ancestor Silk Robes were crafted instead of Rubedo Leather items. Removed a d() message that was left in by accident. Also added in rudimentary error saving. It will not completely stop incorrect crafting, however if crafting goes on for more than 18 pieces of equipment, it will no longer craft. Added German localization. Note: I do expect bugs. Please let me know if you find any. At this point, I would suggest turning Autocraft off if you are using the German version. Also, this is not a complete localization - it is only a functional localization. There are quite a few strings that are not translated yet. Thanks to Tonyleila, Scootworks, and Senaxu. Fixed a bug where the addon would continue to grab items from the bank, even if the player already had some. Added a slash command, /dlwcfindwrit which will aid me in providing support to people who find bugs. When grabbing items from the bank, a message will tell the player about it. I... think I might have uploaded the wrong one. Oops. Fixed some bugs that had been introduced. Added in writ grabbing. The addon will now attempt to grab food, runes, and alchemy mats for writs. The bugs introduced in version 17 have been fixed. Sorry! Upon choosing the default settings in the tutorial, the window will no longer disappear, and it will now transition to the crafting stuff. Fixed a few more issues with the tutorial. Made a table local that had been global by accident. Fixed some issues with the tutorial. Added another tutorial message about styles, and a message that the addon does not do provisioning and alchemy. Fixed a possible bug with ebony writs. Added in a settings menu with Lib Addon Menu, with options to use auto craft, show the info window, and disable the addon for certain crafting skills. If you run out of all racial stones that you can use, you will now receive a message telling you that. The count of mats needed will now more closely follow the amount still needed. Fixed a bug where writs requiring cotten epaulets would craft cotton robes. Was not crafting Orichalc items. Will now craft them. Fixed the names of materials. Rather than the window telling you the prefix armor crafted with the material has, it will now tell you that you the actual name of the mat. Fixed the sound issues with enchanting. If the quest indexes get a bit messed up, (i.e. skip numbers) the addon will no longer ignore some of them. My addon is up to date but I don't seem to be receiving notifications surveys and gold mats anymore even though the setting is on. Is anyone else having this issue? Yes that happens to me as well. Sadly, I got an odd glitch. I asked in guild, I am not the only one, but some aren't experiencing it at all. It may be another addon is interfering, I don't know. I open any crafting box or reward box, it autoloots, but still shows me a blank window asking me to hit R to loot all. I tried different settings in Writ Creator, but nothing fixed it. Reverting to 2.6.1 lets me autoloot the crafting boxes with no blank window once again..
Again, I am not sure if this is another addon interfering, or what. Hey, there's kinda always been minor issues like that with the auto loot. If you move (or if moving, stop then start moving) or hit the alt key, it should go away. I'm still having problems with the autoloot options. Which ever way I try it all boxes (rewards+material containers) either all get looted or not opened. I cannot seem to find the option to just disable autoloot of the gold reward boxes. Do make sure you have the correct version, though. You must also have LibAddonMenu installed. For me it only does that if I don't know the required glyph on the character, but it has been a bug for a while. If you are doing master writ and daily writ simultaneously - you will get 1 glyph for master writ and 2 glyphs (x2 norm) for daily writ. If you are doing only daily writ - everything works fine. p.s. all my 10 characters know all runes - so that's not the problem. Relatively rare double crafting issues with Enchanting are a known issue, though admittedly when it's not the runes is a new one. Unfortunately it's a little complicated to fix, so I may well not really fix it. That said, use Writ Worthy instead for Master Writs. I can't say enough how thankful I am for this addon! Thank you! Hmm that's a little weird, but I don't think I'll do anything if it seems like it's because of the event boxes. Sorry, but I won't be looking into this. Not really supporting master writs anymore. I highly suggest using Writ Worthy instead. Haven't changed anything, so no idea what could have happened. German client. I had Master writs from different professions for the "Rüstung der Verführung" set. Somehow it was able to craft this when I had the quest in my log! But from rightklick > craft seald writ it did not work and it crafted non set items instead. (RiP my Nirncrux). 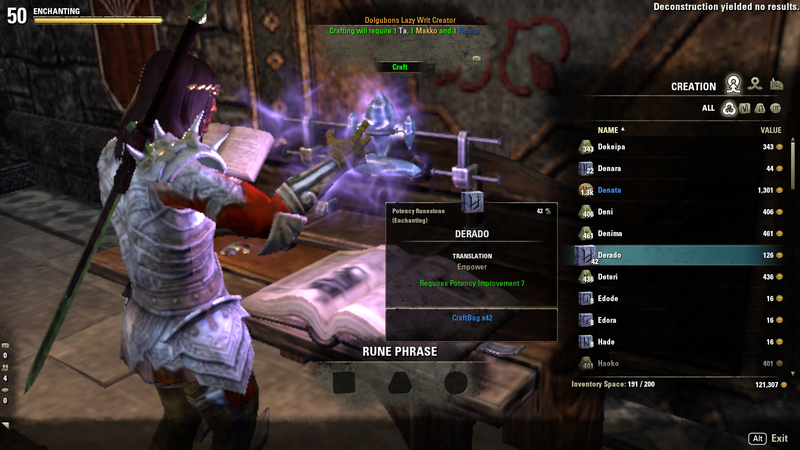 Enchanting module is crafting two glyphs for daily writs if you are doing master writ too. Fix it, please. And thank you for the best ESO addon! Last edited by Viust : 04/09/19 at 04:06 PM. Thanks for the quick response and update! Thank for the quick update Dolgubon and again for your amazing addon! !